What a comparison between the NIMBY minority in Draper who is trying take TRAX away from the best route possible because they feel they are too go for it and the attitude in West Jordan. 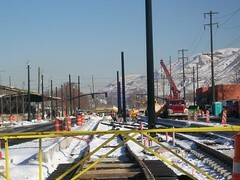 Construction will soon start on the line out to Daybreak which will pass right through the heart of West Jordan. A big project that West Jordan has been working on is the redevelopment of the shopping center at 7800 South and Redwood Road. The first place I lived in Salt Lake City was at the Southwillow Apts at 7000 South and even back in 1997 the shopping center at 7800 South was dying. TRAX could give this center new life and if West Jordan allows it to develop properly could be one of the premier Transit Oriented Projects in the area. West Jordan will need to do some taming of the Redwood Superspeedway in the section of it is to become a pedestrian friendly area, but it area does have lots of opportunities. West Jordan could even do something really special and focus on locally owned retailers for the center and show that a center can focus and market toward local retailers and make a success out of it. However, that wold take not only strong leadership on the side of the city, it would also take a management team of the complex who can make it happen. The Transit Riders Union and Jobs for Justice continue their misguided quest. Wow, I think we have seen more articles this week than in the last six months. Just points to lots happening in the area which is a good thing. By the way the picture show I took yesterday when I had a couple of hours downtown. 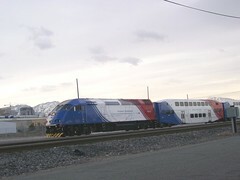 I was lucky enough to get my first picture of a Front Runner train testing. Haven't had much luck in getting photographs of them yet. Some may want to respond to this article since Packard is already spewing his nonsense on it. Tammi Diaz from the Transit Riders Union has already responded to this one with more of the Transit Riders Union misinformation. So far this looks pretty good. Interesting article from Charlotte showing how ridership has skyrocketed after their light rail line opened. Having lived in Charlotte for two years I can tell you that their bus system was next to useless (anyone who says UTA is bad should have been forced to ride CATS when I lived there). Thank you to the Transit Sleuth out of Portland for referring the article above. Then there is the Bus Riders Union and its allies. I guess when the facts are not backing you up, you do a dog and pony show in order to get heard even if you are wrong. Don't get me wrong, UTA is far from perfect, however these people don't want good transit service they want pathetic transit service. Maybe its time to start figuring out where the funding is coming to these people. After all, when the Bus Riders Unions financial statements became well known they started loosing respect. Of course the Bus Riders Union here in Salt Lake has little respect but sometimes even a small group despite they don't represent the majority can do long term harm. Through part of Orem State Street is already 3 lanes in each direction and now UDOT is looking to expanded it to 3 lanes all the way to Pleasant Grove. While drivers will be happy about the expansion, once again pedestrians will once again the planners will not even take pedestrians into account when expanding the road. Anyone who has road the 850 State Street bus and then tried to cross the 7 lane wide State Street knows that you are taking your life into your hands when making the attempt. There is no pedestrian escape zones along the median so you must cross the entire 7 lanes in one traffic light circuit. Could that be one of the reason's why you see so few pedestrians on this road? These seven lane semi super speedways are nothing but barriers dividing the two sides of the street. I am not saying don't build the road, but UDOT needs to do a better job of making these streets less of a barrier and more pedestrian friendly. This is one of a series of videos on Pedestrian Safety. This one deals with an program being done down in Orlando, Florida plus what is being done in a few other cities. There is a section about Greenville, South Carolina which mentions putting sidewalks into areas that don't have them especially around schools (listen up Holladay). It is long at 28-minutes but does provide some ideas that could be implemented here in the Salt Lake region or lessons we should learn. I will post more of this series in the future. In their first posting in months, the planner from the UTA is claiming success for UTA's F94 flex route service. While I agree that the route is providing a service that UTA was willing to abandon, I think success should be measured in different terms that the UTA does. First of all, the route only provides every 80 minute service. This makes the service useless for a majority of transit riders thus greatly decreasing how much potential the service has. Second, the route only deviates ¾ of a mile from the route of the old 94 route which makes it too inflexible to truly be called a flex route. Now take a look at Denver’s Call N Ride system and see how it works. Basically you have cutaway vans based out of a light rail or bus transit station and service is provided a minimum of every 30-minutes (and in my experience the service is much more frequent than every 30-minutes). 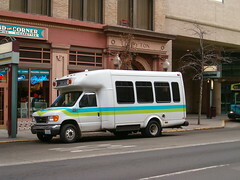 Call N Ride provides transit service to entire areas providing much better and more convenient service than regular route service could in those places while still providing good connections to the regular route service. Now let’s take a look at route 525, the former 25 that provides service from TRAX to the Sandy Industrial area and along Monroe. This route would be a perfect route to turn into a Call N Ride route. If people need to be picked up they just give a call or they pick the cutaway van up at the TRAX station. While the Historic Sandy TRAX station may be a little more convenient for this service, traffic along 90th South is just going to get worse so it does make sense to use the Midvale Center TRAX station. The neighborhood will get better bus service with vehicles that make more sense for the area. Another area were Call N Ride service will make since is along the Daybreak TRAX line. Service could be provided too many areas that currently and will continue to have non-existent bus service. There is areas such as South Jordan and Herriman that regular route service does not work but Call N Ride would make sense. A side benefit of this type of service is that it can also reduce trips by Paratransit since some Paratransit riders could use regular route service but cannot get to the transit station; this allows them to use the regular route service and still use the mobile van. Considering the financial black hole that even advocates for the physically challenge know Paratransit service to be, reducing any need for Paratransit service makes more service available to all. The F94 is a start, but to be truly useful transit service it still has a way to go. Here is an article from today's Salt Lake Tribune about development of 5600 West. Having worked at 2100 South and 5600 West from 1998 to 2000, I can attest to the changes that have taken place along the 5600 West Corridor. However, part of the article details UTA's plans for the corridor and once again they just do not make sense. First they propose putting in a BRT line. Next they plan to convert the line to full Light Rail configuration within the next 25 years. This is a case of over engineering a solution to the problem. First of all there isn't even any transit service in this corridor except for a couple of "fast buses" during the peak hours and the 47 connection between 4700 South and 4100 South. 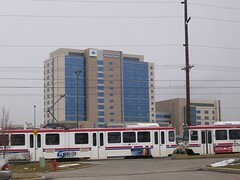 Considering the questionable success of current BRT projects, a much better solution would be to just implement a regular bus route for now from the airport to connect up with South Jordan TRAX line once it opens. This would service a larger market than a BRT line in the corridor. Then instead of upgrading the BRT route to a full light rail service which would be overkill in the corridor, go back to the original plan and implement a streetcar or a semi-rapid streetcar. The line could start at Daybreak on the TRAX line, travel with the South Jordan TRAX line where it would connect up with the former Rio Grande/ Union Pacific branch line to Magna. It could travel next to the branch line all the way to 5600 West when it would enter 5600 West travel through the airport Industrial park then hook up with the Airport TRAX line to the airport terminal. 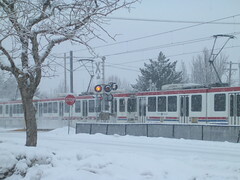 This would allow a relatively fast trip connecting two important TRAX lines. In addition it would cost less to build than a full blown TRAX line which is not needed in this corridor. Article about new emissions requirements. The article mentions that the engines themselves are built overseas but does not mention the overall locomotive is assembled in Boise. OK, first of all, if I was reading this response it would go in file 13 ASAP. Talk about an unprofessional response. No one will listen when you spew like this except for the few people who have the same political agenda as you. UTA did not have a public meeting on this proposal. p.m. 223 bus to the outbound schedule. Now, I have no idea what this guy is talking about when it comes to the U of U professor and if you read the rest of the letter it is clear he doesn’t know what he is talking about. Throughout the letter he makes statements that are untrue or show we say that they use “creative license” with the facts. First of all 100 plus did not ride the nightride (he is referring to the old 107). According to ridership records which compares to my observations of this route when it was still running, it averaged 62.9 riders per night (winter months higher, warmer months lower). That averages out to less than seven riders per trip. Of this ridership, 90%+ was north of Interstate 80. Now you would think from this guy’s attitude that all “evening” service was killed. 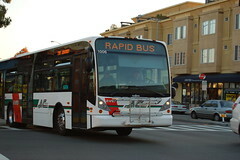 On the contrary, there is still “evening” service provided to the area by the 21 and other routes that provide service to a majority of the riders who used to ride the 107. In fact there is “evening” service along 3300 south. Finally he complains that UTA ADDING service to the 223? Talk about a whine and cheese session because UTA didn’t have a formal public hearing about it. Well, I hate to tell you sir but UTA doesn’t have to have a public hearing when adding a run to a route. The last time I checked they need to have a public hearing when they are changing 25% or more of the operation of the route, so one run will not rate a public hearing. and ATU(Amalgamated Transit Union) agreed to recently. other transit managers. What a shame! Huh? The last time I checked there were no cuts in October since UTA usually changes bus service three times a year and that is August, December, and April. Somehow I get the feeling that some bus driver is feeding this guy a load of bull and he is running with it as “insider information”. #2 UTA lied about the ridership increase. UTA "cooked"
Hate to tell you this, but even with the adjustment in the ridership numbers, ridership is still up thanks to TRAX but we have already seen that you understand how to cook numbers and we shall see more in part 4. Facts are facts; TRAX is creating new ridership and will continue to do so especially the Daybreak line that will give service to areas that have lousy bus service now. 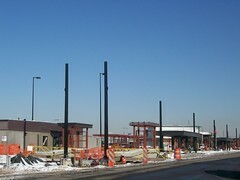 If you look at the lower cost per passenger on TRAX, it will soon pay of its cost of construction or already has. Should I go into the economics professor? After all if you line up 10 economists in the room they will have 10 different opinions. I had 3 economic professors in college and the three of them could not agree on the day of the week much less anything else beyond the basics. Clearly the BYU professor has his political slant and will not let facts get in his way. Let’s take a look at number 4. Sorry, but this one shows that the writer is not only wrong but he will take “creative license” with the facts. the numerous transfers they must make. and the bus/Trax is on time it takes me 66 minutes. OK, let’s look at the fact that shows that the writer lied here. The 223 at 20th E. 27th South does leave at 6:18AM. OK so he told one truth. Now doesn’t it seem odd that it would take a bus from 6:18AM to 7:10AM to get to the University? Well guess what, there is something odd because it is not true. The 6:18AM bus from 20th E. 27th South arrives at Stadium TRAX not at 7:10AM but at 6:35AM. The next bus 30-minutes later does not even arrive at 7:10 but at 7:05AM arriving at the Business Bldg at 7:08AM, so were does this person get his 7:10AM number from? 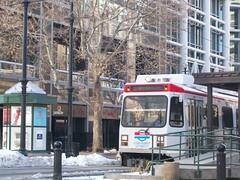 TRAX then leaves at 6:44AM arriving at the Civic Center Station 6:57AM so a total elapse time of 39 minutes, one minutes less than the 40-minute that it is “claimed” to have taken him before. Maybe this guy should read the schedules better since it is clear he either does not ride the bus or is just not telling the truth. Then there is point 5 talking about the Davis county situation. While the county did a poor job of saying what the initiative as for since from my interpretation it was a highways bill only, it is clear that money from the food sales tax is being lost clear and simple. hearing from several of my insiders that this U. of U. Here is more of the “insider” information. Here he says the driver does his or her best job. Clearly he is taking information from one source, a dubious one at that, and taking it as fact. Actually as I mentioned before most of Sugerhouse area has better “evening” service than it had under the old system. After all they have the 209, 220, and the 21 that all provide evening service. However, most of those riders were along the stretch that still has good evening service. While it may be a few blocks away, there is evening service on the 33 down on 3300 South. It is clear that the Transit Riders Union will not be satisfied until they have the service THEY want and everything else is bankrupt just like Los Angeles. We have seen the damage that can be done when a group gets too powerful and can start dictating policy no matter how poor the policy is. Because of the consent decree in Los Angeles, the Bus Riders Union was able to dictate policy to METRO for 10 years and now the Los Angeles area is seeing bus service cuts because of how badly the Bus Riders Union drained the METRO resources. While Eric Mann the head of the BRU drives around in his BMW, the bus riders of Los Angeles who he claims he helped now have worse bus service than ever. Let’s make sure that does not happen in Salt Lake City. Before I post a very serious blog, I had to post this for a little comic release. For the second Monday morning in two weeks the overhead power wires for TRAX have been severed just south of Interstate 80. So what is happening here? One time may have been an accident but twice? UTA and others need to consider this an act of sabotage. After all this area gang infested and they could be involved. It does appear that UTA is doing a better job of communication with this incident sending people to all the TRAX stations to inform what is happening. Once again, while I think Bluffdale is being stupid and has their heads in the sand in not supporting a commuter train station--(will they try to stop the highway? ), however the legislature should not be forcing them to take the station any more than the legislature telling Salt Lake that it cannot spend airport funds to help transportation to the airport. With UTA, who needs an office? While I am no fan of Lee Benson, he does do a very complimentary article about Wi-Fi on the 472 Express Buses. OK, what does Seattle have to do with UTA's 3500 South BRT line? Well, the Seattle Transit Blog has done a question and answer session with Metro (their transit system) about what they are calling Rapid Ride. -First Metro is rightly so saying that BRT is not an alternative to rail, it is being used to provide a faster supplemental service along a busy corridor. It is not being referred to as "just like rail...just cheaper". -While the 3500 corridor does have high current transit demand (although not by Seattle standards), the others are questionable. On the other hand, please tell me what regional trip attractors and generators are present along 3500 South except between TRAX and the West Valley Mall. I have mentioned before the BRT is going to do little to improve the corridor and most likely just steal riders from local routes. The BRT will not add any new markets and considering UTA is going to kill the regular route 35, there is obviously no need for a supplementary service. 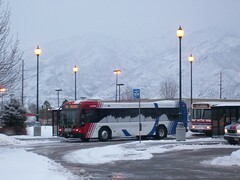 A BRT route from Valley Fair Mall to TRAX to the eastside to the U of U would make more sense. Even better would be a BRT route from Ogden to Salt Lake City. This would not compete against Frontrunner since it would provide much more local service but using the technology would actually made a difference in trip times. After all when you are talking saving a half hour off a two hour schedule, then you are talking some time savings. Once again this would not be designed to replace the existing 470 but supplement it with faster service. You could actually replace the 455 with this new service and provide local service by reinstating the 471 to all day service. That way you would have faster service along the US89 portion but the 471 would provide local service were it is still needed. This would provide a route that makes sense, can use the faster speeds, create new markets, and actually improve the route network. The picture is of Eugene's new BRT buses, and yes they do have doors on the left side. Well it looks like the funding for the airport TRAX line will happen despite the actions of our state legislature. Once again Bramble showed his stupidity but saying that Airport funds should be used to help improve the airport. I hate the tell the guy this but giving people the freedom to choose how they get to the airport would be an improvement. But I guess Bramble only thinks its an improvement if it funds roads since a large amount of dollars have gone to improve the roads at the airport. Instead part of the $10.00 fee for registering cars in the county will go this fund. Actually since that money can only go to highways, other money will replace this money and somehow fund TRAX. In other words we take from here, give to this place, move this over here, and accomplish the same thing that could have been accomplished much easier if our state legislature would stop trying to control everything. Just a reminder that TRAX service will once again be interrupted south of 7200 South on Sunday due to construction of the new State Street Bridge. 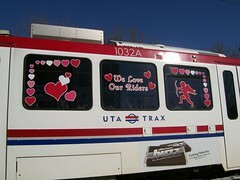 It looks a little funny on the UTA website because it says that TRAX service will be interrupted Weekends and Sundays. Only last weekend did they interrupt service on Saturday the rest of the interruptions will only be on Sundays. However, when you first get on the website before moving on to the actual news release it looks as though they are saying TRAX will be closed weekends and Sundays as though Sundays are not part of the weekend. A couple of weeks ago I had an appointment in downtown on a Friday morning so I took some pictures of TRAX construction on the Intermodal extension. After taking pictures of the construction I drove pass the Arena station and saw the decorated windows on one of the TRAX cars sitting there on a University train so I snapped the picture. Oh and before someone jumps down my throat for not riding the bus to downtown, I had another appointment in an area along Highland with no bus service (if the old 8 was still running that would have been a different story...). When I attended Railvolution here in Salt Lake City in 2005, one of the sessions I attended talked about how some recommendations for designs promotes more sprawl. Among them is the design recommendations for new schools. They are designed to encourage sprawl, make it impossible for students to walk from school and close smaller community schools in favor of "super sized schools". For more information see the Walkable Neighborhoods Blog. How much does Wal-Mart really cost? 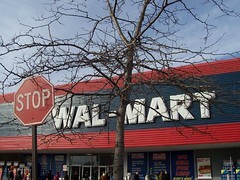 Previously in this blog I have discussed Wal-Mart and its hidden cost. Much like highways, many people don't realize exactly how much Wal-Mart truly cost because many of the subsidies it receives are even the Billion dollars or more of direct subsidies are brushed under the carpet. Here is another example of a hidden subsidy for Wal-Mart. UDOT is about to proceed with a huge interchange project and railway overpass in the Springville area. For people familiar with the area will know that the entire area changed with the opening of a Wal-Mart Supercenter. The problem with a place the size of Wal-Mart is that it concentrates so much traffic into such a small area. In addition anyone who shops at this center comes by car since there is not transit service here except for the nearby Park N Ride lot. Now there is a project to rebuild the interchange where the Super Wal-Mart is located and a railroad overpass nearby. While this is one of the major entrances to the city of Springville, the entire character of the area was changed with the Wal-Mart opened. Of the 82 million dollar cost of the project, how much can we contribute the the supercenter? Lets assume that 25% of the project is caused by the Wal-Mart and the rest by growth in the city (I think you would be hard pressed to figure out all of this infrastructure would be needed without Wal-Mart). That would mean that $20 million of this project is directly contributed to the Wal-Mart being located at that off ramp. Most Wal-Mart's in the area bring an estimated $500,000 a year in sales taxes. That means it would take about 40 years of sales tax revenue for Wal-Mart to pay off its portion of the sales tax. Now lets say the the businesses that located in the area because of Wal-Mart generate another 250,000 in sales tax revenue, you are still talking 30 years before just this project is payed off by the revenue. That does not include the other cost that go up with a Wal-Mart such as police and fire. So how much did your Supercenter truly cost???? A front runner train will be on Display at Ogden Union Station today and tomorrow at the Hostlers Model Railroad Show. This is a great time to go and see what these great trains are like. This is also a great place to see what model railroading has to offer. I cannot make it up there this year because of family obligations but I have in previous years and it is an excellent show. Also remember that TRAX will be closed again from Historic Sandy (9000 South) to Midvale Fort Union Stations (7200 South) for construction work on the new State Street overpass that will eliminate the last piece of single track obstruction on the line.